The first Vermont political candidate in a decade to secure public financing says he thinks all state elections should be funded by taxpayers. Standing in front of Burlington's iconic "Democracy" statue Thursday afternoon, Progressive lieutenant gubernatorial candidate Dean Corren argued that public election financing is the only way to reduce the influence of money in politics. "Let me make my position clear: Big money is the opposite of free speech," he said. "And when it dominates our elections, it is the opposite of democracy." To drive the point home, the former four-term Burlington state representative highlighted his opponent's fundraising practices. Incumbent Lt. Gov. 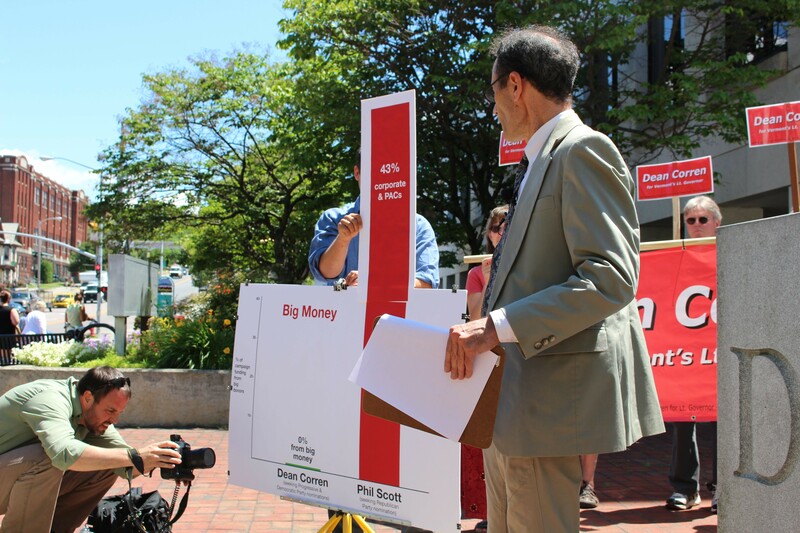 Phil Scott, a Republican, raised 40 percent of his contributions when he ran for reelection in 2012 from those donating more than $100 and 43 percent from corporations and political action committees, Corren said. "With big money putting up these kinds of numbers, it's fair to ask who gets to speak, who gets listened to, who gets to call the tunes," the Progressive said. "Everyone knows the answer to that question: It's the one who pays the piper." Corren's campaign has benefited from a recent change in state law that doubled the amount candidates for governor and lieutenant governor can obtain in public financing. By raising more than $17,500 from 750 voters contributing less than $50 apiece, LG candidates are guaranteed $200,000 in public funds, minus what they raised to qualify. Gubernatorial candidates can secure up to $600,000. Within 37 days of entering the race, Corren noted Thursday, he raised $19,283 from 826 Vermonters, who each contributed an average of $23.35. "What's the cost of that public financing? Twenty-nine cents [per Vermonter] every two years," he said. "On the other hand, what's the cost of big money campaign finance? How's the middle class doing? How's everyone but the wealthy doing? That's the answer to that question." How much would it cost to expand the system to all statewide and legislative candidates? Depending on the amount each candidate received, Corren said, the price tag could range from $2 million to $2.5 million. At the higher end, he suggested, candidates for attorney general, secretary of state and other statewide offices might qualify for $150,000 in public financing; candidates for the state Senate might qualify for $8,000; and candidates for the House might qualify for $3,000. Reached later Thursday, Scott said he was not inclined to support such a system. "I don't mind having the debate, as with anything, but I guess at first blush I feel as though Vermonters are taxed enough as it is," he said. As he has previously stated, Scott said Thursday that he "would rather solicit money from those who are willing to give to my campaign and believe in what I'm doing, rather than take it from taxpayers who have no choice." "I don't feel as if I owe anybody for receiving money from them," the incumbent added. While Corren criticized Scott's reliance upon big money and corporate contributions, he was careful to avoid disparaging Democrats, whose support he is courting. In addition to the Progressive nomination, Corren is seeking the Democratic nomination as a write-in candidate. Two weeks ago, he was endorsed by Democratic Gov. Peter Shumlin, who raised hundreds of thousands of dollars from corporate and PAC donors in the last election cycle. Asked about the governor's fundraising practices, Corren said, "I think anyone who raises money from corporations is subject to you saying so. To me, I don't take that kind of money. I've never taken that kind of money. My party doesn't take that kind of money. And so I don't have to worry about that for myself. Others have to respond for themselves." 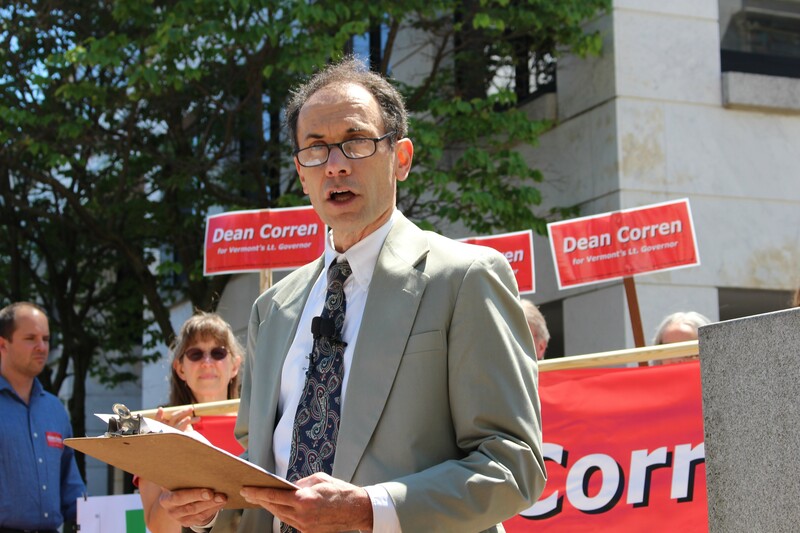 Does Corren think Shumlin should refrain from raising corporate cash? "I would think that would be wonderful if he did," Corren said. "I think that public financing would be a good solution. It's a little too late for this [election] cycle now. But I think that would be wonderful, and I will suggest that to him."